For a nice change, I actually managed to get caught up in my classes by yesterday evening, so I got to spend today doing non-school activities. Woo hoo! And for a rare change, I didn't just fritter away the day watching Netflix or goofing off in Facebook applications. Maybe I should have spent the day sorting and packing and cleaning, but I instead spent the day finishing an old sewing project. Since my sewing room is likely to get packed up and put into storage during the remodel, I'd like to finish at least some of the projects I have in the works. With February 14 quickly approaching, I figured I'd better get this square dance skirt done. Last spring, after I finished this square dance skirt the first time, I didn't like how gathered the pieced panels looked because the hearts were lost in the gathers, so I actually disassembled the skirt and removed three gores. Now I could have just cut out the gores—ruffle and all—but I didn't think the top ruffle was full enough, so I took it off first. I carefully removed it to reuse it because I didn't have more fabric. And then I hand-gathered the ruffle this time, rather than using the sewing machine ruffler, and sewed it back on. 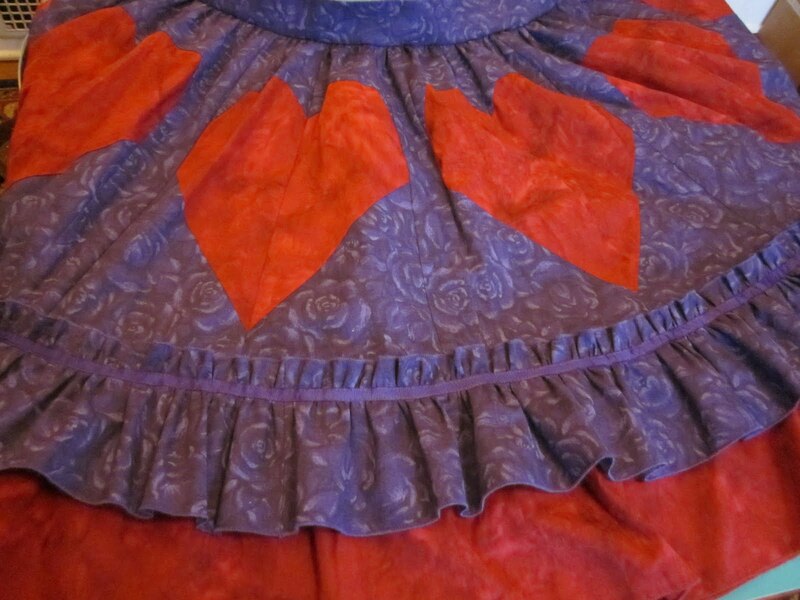 So, my pieced heart square dance skirt is finished just in time for Valentine's Day. I'm still not entirely pleased with it, but I think it is good enough. I do still need to make a matching tie for Jeff. I'm hoping I can find some of that fabric leftover, but it wasn't packed up with the skirt. And since I was on a roll, I also pulled out the funky dragon skirt I started last spring. I finished sewing it together and put the rolled edge on the hemline, but I didn't quite get this one done. It still needs a waistband, but I ran out of gas before I finished. Since it will probably only take me about an hour, I'm hoping I'll talk myself into finishing it later this week. Cute! Very creative! Now I have to finish the girls' dresses for Ursulmas. do you know who makes this fabric? do you know who makes this fabric? I'm dying to know. If you are referring to the dragon fabric, it was made by a company now out of business: Rose & Hubbell (I think).